The Knicks are about to get some much-needed reinforcements. José Calderón, who has missed the first 13 games of the season with a calf strain, is expected to return for tonight’s game against the 76ers. 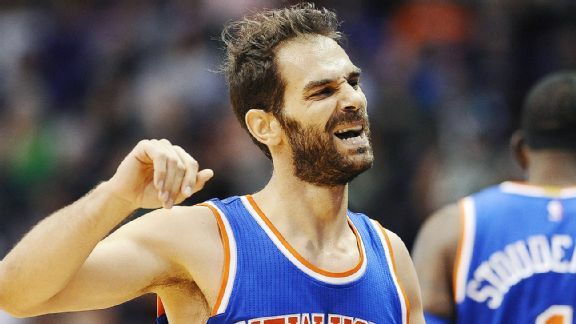 The Knicks traded their best defensive player, Tyson Chandler, for Calderón in the offseason, and as you would expect, the move has done more harm than good with the 33 year-old Spaniard sitting on the bench in street clothes. Calderón is a poor defender, but a strong offensive player and a fantastic shooter, so he should give the Knicks a boost as they continue to grapple with the Triangle Offense. However, Andrea Bargnani, also expected to return tonight from his hamstring injury, suffered a calf strain of his own in practice today, and will not return tonight (or, one would assume, for at least a couple weeks, given the length of Calderón’s absence). This entry was posted in Articles and tagged Andrea Bargnani, andrea bargnani injury, andrea bargnani knicks, andrea bargnani return, jose calderon, jose calderon injury, jose calderon knicks, jose calderon return, KNICKS, knicks blog, knicks injury, KNICKS MEMES, Knicks news, knicks rumors, thomas rothman, Tommy Rothman, tommy rothman knicks on November 22, 2014 by Tommy Rothman.